Win Concorde Hotel Spices Cafe Buffet Vouchers Worth $200+! You are here:Home » Product Reviews » Win Concorde Hotel Spices Cafe Buffet Vouchers Worth $200+! Imagine digging into fresh seafood like Rock Oysters, Sashimi, Scallops and Prawns at Concorde Hotel Spices Cafe with your partner! Savour local delights, a variety of Crab dishes, and you even get a Complimentary Serving of Baked Half Lobster (200gms) Gratinated With Cheese OR Braised Baby Abalone with Broccoli and Mushroom! For what's available at the dinner buffet, hop over to Concorde Hotel Spices Cafe Afternoon Tea + Seafood Buffet to drool! 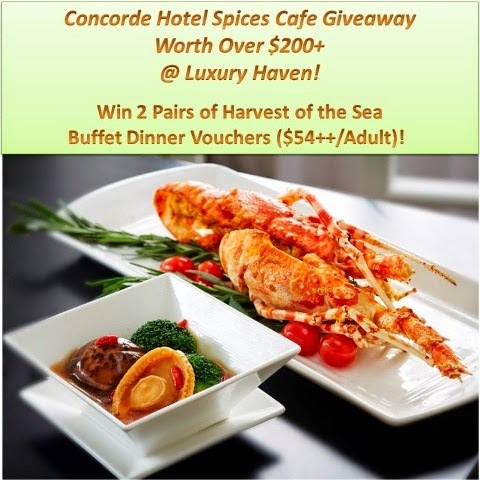 Thanks to Concorde Hotel Singapore, Luxury Haven is giving out 2 Pairs of Spices Cafe Harvest of the Sea Buffet Vouchers Worth SGD 54++/Adult! To win this giveaway, simply complete the steps in the #Rafflecopter box below! Don't forget to share the giveaway photo and tag your friends in Facebook or Google+. When you're all done, let us know in the comment box at the end of this post. * Tips: The more steps you complete, the more chances you'll get! The #Rafflecopter tool may take time to load, so be patient. Read the T&C below the Rafflecopter Box for more info. Ahh this looks like an awesome giveaway! I wish I could enter but I live very far haha! Good luck to everyone though!! Another great giveaway from Luxury Haven. Vincent, just ignore that then. It's ok. Good luck! Done. Thanks for the giveaway! Hope to win this for my birthday month!! Liked + shared + tagged + commented! Done. Thank for the lovely giveaway. Hope at least lucky this time. Ok Done. Liked, Tagged and Shared. Thanks for org this giveaway! All done, hope to win and go and enjoy e buffet with my hubby!! Wow, I'd love to go there! Disappointed that I'm across the sea. Best of the luck to those wishing to get the vouchers. I tagged more ten friends and I really hope u don't mind because such good contest need to spread it around the world or cross universe if possible. I joined and I hope to win the voucher and give my parents a great treat. I have joined this fabulous Concorde Hotel Spices Cafe Buffet Vouchers Giveaways. Liked, shared, joined and never won. Hope this is my lucky month to win. I have joined, like and shared this post too. Nice giveaway. Good luck to all the participants. I love this Concorde Hotel Spices Cafe Buffet Vouchers Giveaways! I have like & shared this contest too. Done! Hope I can win! I love food and your blog. Hope I am third time lucky in this fabulous giveaways. And thanks Shirley for the invitation! Hi Shirley! :) I've completed ALL of the steps. My favourite aunt is named Shirley and you remind me of her, thank you for hosting this contest! Hoping to win (haven't won anything before). Nice giveaway. Thank you so much for hosting it. Indeed, what an Awesome Mouthwatering Luxury Haven Giveaway! Yummy! done :) all the best and thanks for this lovely giveaway! Thank you Shirley & Concorde Hotel Singapore. It's so Delicious Mouthwatering ! Hope to Win Concorde Hotel Spices Cafe Buffet Vouchers. Thank you for organising all these wonderful contests for us to win. Hoping I'll win cos I want to bring my family to Concorde Hotel Spices Cafe for their sumptuous dinner! Thanks for the promotion. I promise to keep my dieting plans aside for one day if chosen. Thank you Concorde Hotel Singapore for hosting this giveaway with Luxury Haven!